Quarter Acre Cottage: We have Chickies! My sweet hubbs surprised me with a box of baby chicks for my birthday! They are so cute and tiny, and I pray to God that I don't kill them. He did such a good job too...he picked out 3 different breeds so they all look different (at least they will when they get older) and the different breeds lay different colored eggs. Good way to keep track of who's earning their keep! We have two Silkies, one Blue and one White, an Ameraucana, and a Buff Orpington. The Silkies are apparently the "poodles" of the Chicken world. The Ameraucana kinda looks like a hawk, some are more colorful but I think this is pretty close to the same coloring of my Chick. 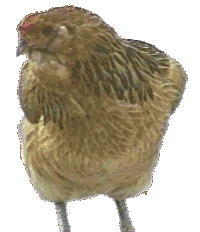 And finally the Buff Orpington, she is a pretty standard golden girl. For some reason this is what I always thought of as the standard chicken. I have been looking and there are some Swanktastic chicken coops out there.Can't wait to get started!